It was fourth time lucky for Haryana Hammers as they beat Punjab Royals 6-3 in the summit clash to win the Pro Wrestling League (PWL) season 4 title. 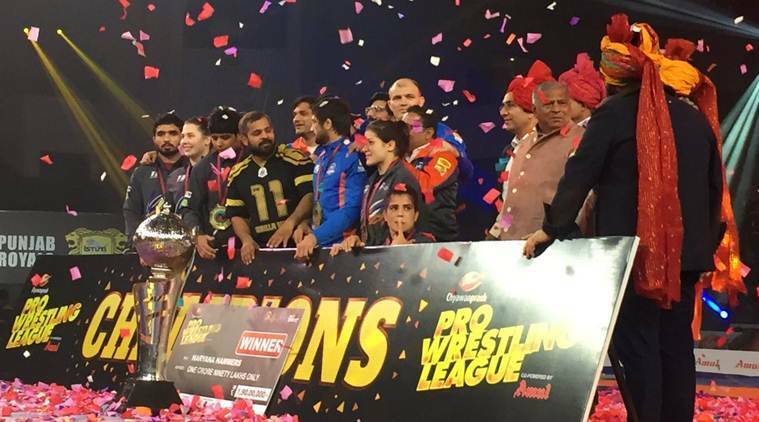 It was fourth time lucky for Haryana Hammers as they beat Punjab Royals 6-3 in the summit clash to win the Pro Wrestling League (PWL) season 4 title here on Thursday. Riding on Aleksander Khotsianivski, Ali Shabanov, Kiran, Ravi Kumar and Anastasia Nichita’s dominating performance, Haryana Hammers, the runners-up in the last three editions, turned the tables on the defending champions Punjab Royals by winning all the first five bouts to clinch the title. So dominating was Haryana Hammers’ performance that Punjab Royals’ campaign ended even before their star player Bajrang Punia could take the stage. The Asian Games gold medallist Punia scored an impressive 11-0 win over Rajneesh but it was too late in the day. It was Khotsianivski of Ukraine who put the Hammers on road to victory by winning the 125kg super heavyweight bout against Canadian Korey Jarvis 3-0. Shabanov got his revenge and also broke Dato Marsagishvili’s unbeaten run to win the men’s 86kg bout 4-3 and give the Hammers a 2-0 lead. The 2018 Commonwealth Games bronze medallist Kiran made it 3-0 for Haryana Hammers by defeating the 2018 European Championships bronze medallist Cynthia Vescan of France 3-1 in the women’s 76kg category. After that, the 2018 World U-23 Championships silver medallist Ravi put Haryana 4-0 ahead in the tie after his comprehensive 8-0 win over Nitin Rathi. The world junior champion Anastasia won it for Haryana Hammers after she came back from 2-4 deficit to beat the 2018 European Championships runner-up Mimi Hristova with a pin fall to clinch the bout and the tie. In the remaining bouts, Punjab Royals’ Amit Dhanker won the 74kg contest against Praveen Rana 5-2, Anju added one more win to Punjab’s tally by defeating Seema 10-5 in the 53kg category while Haryana’s Tatyana Omelchenko won the women’s 62kg category bout against Seema 9-0 to complete Haryana’s winning tally.